2014 Children’s Digital Book Awards with Mary A Livingston – Children’s Book Academy. I’ve joined the wonderful group of Blogettes over at Children’s Book Academy, let me know what you think of my first post. 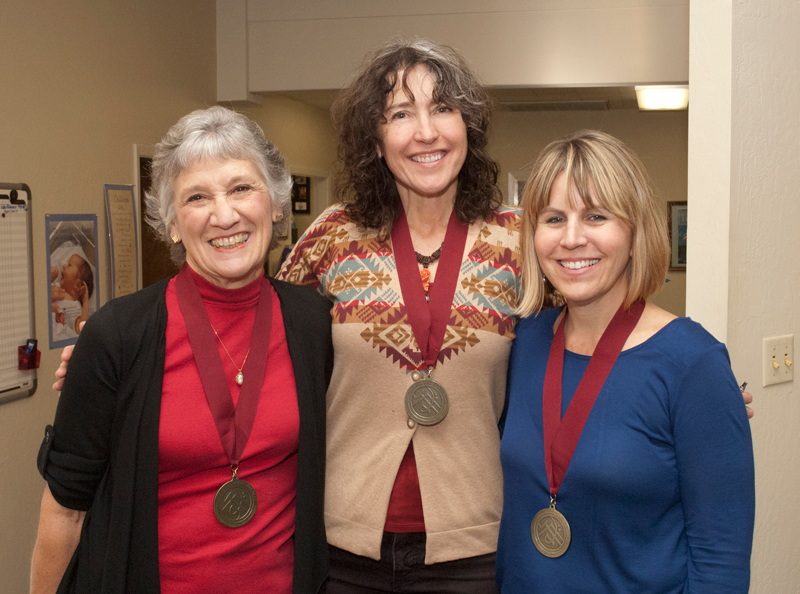 Kandis Lighthall, Mary A Livingston and Patricia Schetter sport their new book award bling. 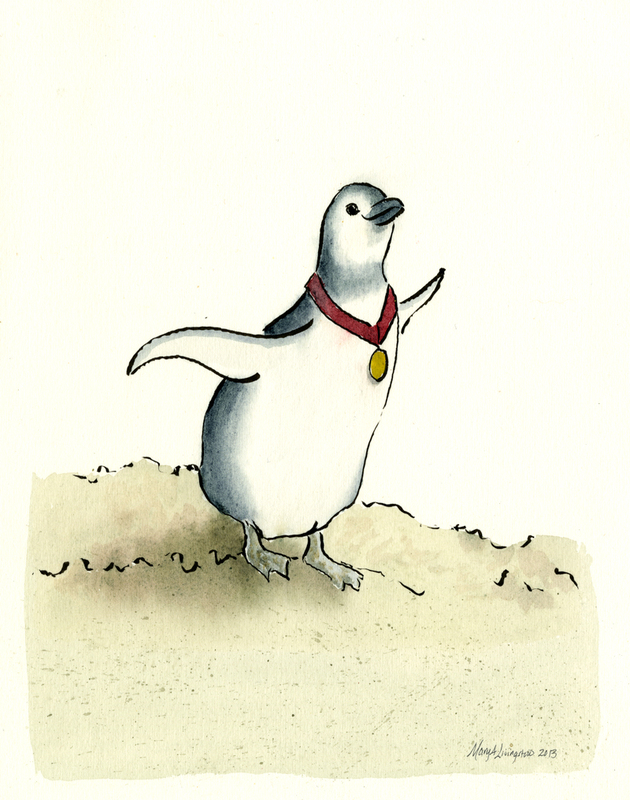 Percy Learns to Fly was awarded Gold in the Motivation and Inspiration category. I couldn’t have illustrated Percy Learns to Fly without loving support from my wonderful husband, Tim, The Forester Artist. Patty, author of Percy Learns to Fly (ABTA Publications and Products), Kandis, educational contributor, and I, the illustrator, received our Gelett Burgess Children’s Book Award medals. I’ve already expressed how wonderful Kandis and Patty are to work with and how supportive my husband, Tim, the Forester Artist, has been, now I’d like to thank someone very special for his help getting me going with children’s illustrations. Mark Mitchell of How to Illustrate a Children’s Book and Make Your Splashes – Make Your Marks! online course was instrumental in my progress as a children’s book illustrator. I started getting braver with art as I participated with the liturgical committee of my parish. During the summer of 2011, I stumbled across Mark’s website while I was looking for some artist resources for an illustrator of one of Red Tail Publishing’s titles. I bookmarked the page, and later, when I was alone, and no one was looking, I gave the site a good going through. I so wanted to illustrate, but lacked the confidence. Typically, I’m a fairly confident person and don’t shy from a challenge. As the calling to art rose louder and louder, it terrified me. So I lurked and stalked the course website, I check out all the email updates. I have always hung around, peeking over Tim’s shoulder, admiring the way his brushes danced across his canvas or how he could just sit and draw anywhere, with anyone looking. But I wasn’t brave enough to just jump in. Then, finally, in the spring of 2012, I signed up for Make Your Splashes – Make Your Marks! Tim was so happy, he bought me my own art table and new brushes for us both. That May, I had my first critique. Angst swept in and consumed me. I had to listen to the replay because I was so overwhelmed during the live feed I could barely hear the comments. It was okay, it was encouraging. Mark and the critique group of my piers gave me wonderful tips and encouraging pointers to help me grow. Before this course, I had been brave enough to pick up watercolors five times. This course demystified illustration and made watercolors feel like an extension of my heart. While I was working on my own book for my company, I was hired to illustrate Percy Learns to Fly. Percy sports his award bling. 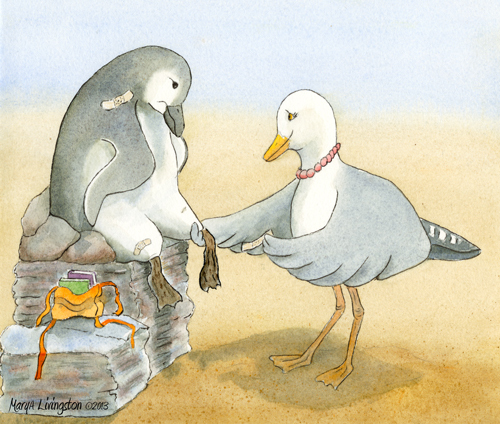 Percy Learns to Fly was the first book I illustrated as I finished it before completing No Place for Ugly Birds. Just image how thrilled I was to learn that Percy won a national award. I can’t express enough how beneficial taking the Make Your Splashes – Make Your Marks! course has been. I highly recommend it for anyone considering illustrating for children. Thank you, Mark, for all you do for the children’s illustration community. Next up a peek into Picture Book Academy. I can’t even begin to say how excited I am. The more I worked on the art for this book, the more I fell in love with little Percy. It was the first picture book I illustrated, and I feel so blessed to be a part of its making. I worked with two wonderful women, Patricia Schetter, the author and Kandis Lighthall, the educational contributor from ABTA Publications and Products. My illustration group from Make Your Splashes – Make Your Marks was invaluable for critiques and points of illustration wisdom. And of course my wonderful Tim (The Forester Artist) is always encouraging. I just can’t stop smiling! 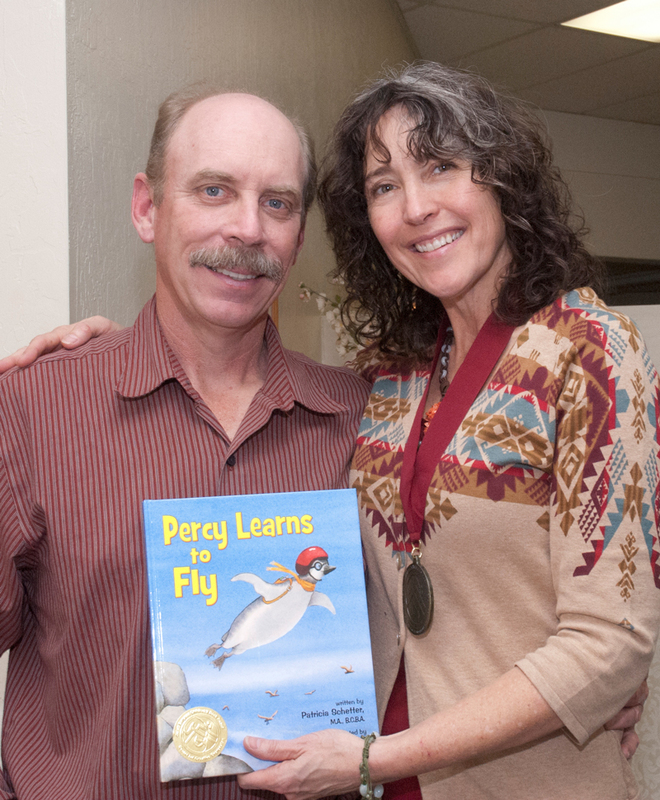 The ABTA Publications and Products children’s picture book, Percy Learns to Fly, has been awarded the 2013 Gelett Burgess Children’s Book Award for outstanding contributions to children’s literature. A Gold Medal was awarded in Lifestyle: Motivation and Inspiration category. 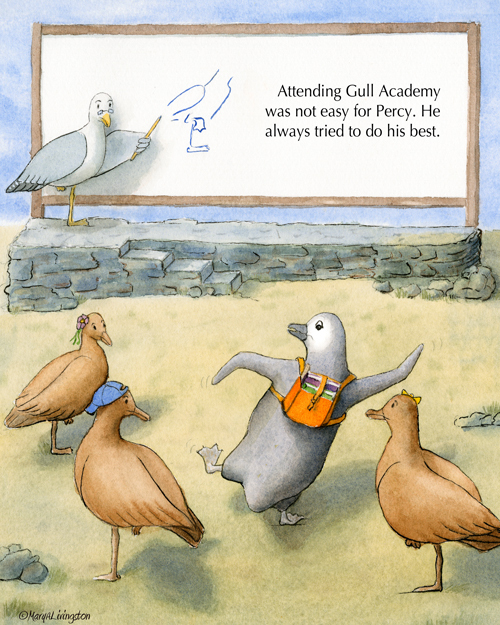 Percy Learns to Fly tells a heartwarming story by Patricia Schetter of fitting in while being different. Everyone can see Percy is different. He tries hard to fit in with his friends and do well in school. 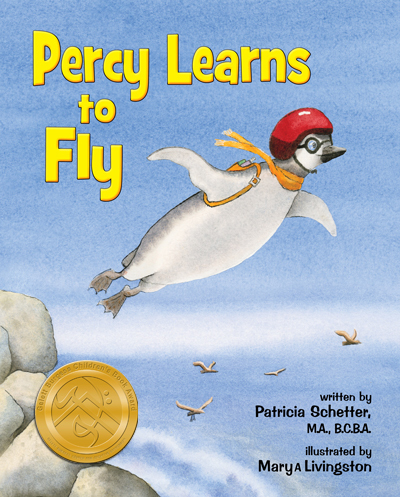 Join Percy in this heart-warming tale with moments of disappointment, excitement and joy as Percy Learns to Fly. Includes an exceptional Teacher and Parent section with resources. I’d like to introduce you to Percy. He’s a love. The poor little penguin is hatched to a pair of gulls. Don’t worry, Percy has heart, lots of heart. I met Percy through author/educator Patricia Schetter. Patty is an all around awesome gal who has followed her bliss. She is a Behavior Analyst and Autism Specialist and she teaches fellow educators. You can find out more about Patty here. Percy Learns to fly was the first book I illustrated. Lucky me! 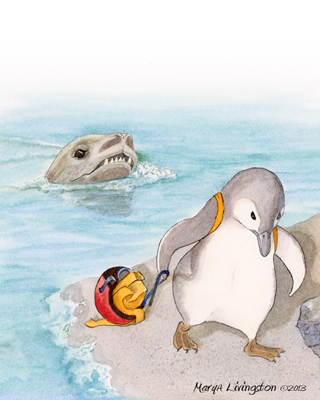 To study for Percy, I went to the San Francisco Zoo and observed the penguins. You see, we don’t have penguins in the wilds of Northern California, so the zoo was pretty much my best option for a hands on look at the movements and behaviors of a penguin. In Percy Learns to Fly, Percy faces danger. As I poured over the story and got to know Percy, I fell in love with his personality and strong heart. Percy teaches a lot about persistence and how in the right environment, we too can soar. So how about you? What’s your environment for bliss? I’ll have more to post on Percy in the coming days…yes, that’s a tease, so stay tuned! It’s been a pretty full summer as I have been pursuing bliss. Just over a year ago I signed up for an outstanding online course and critique group over at Make Your Splashes, Make Your Marks. Through this awesome course with Mark Mitchell I connected up with Picture Book Academy. Growing in bliss is addicting! One final plug about pursuing bliss, don’t miss Marsha and Mira’s Best Character-Driven Contest!! 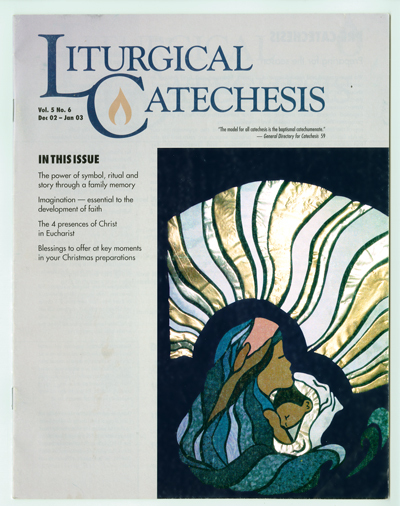 Years ago while I was creating designs for my parish’s liturgy committee, I decided to enter a liturgical art contest. My art didn’t place in the contest. Not even a mention. More than a year later, one of the images of my work appeared on the cover of a magazine owned by the company from the contest. It was my first time as a published artist. It didn’t register with me at the time, even when I opened the magazine and saw my name for the cover credit. As I look back on it, I am glad I put myself out there by entering the contest. The experience fostered a seed planted long ago. I am acquainted with several artists who volunteer their time to illustrate sacred stories. You never know where it will lead, for me the experience was far richer than getting notice on a magazine cover. In fact, I would describe it as bliss. PiBoIdMo 2012 – I did it! Picture Book Idea Month 2012 – 30 picture book ideas in 30 days – whew! It was a lot of fun. I almost didn’t do it. Time is short and the “one more thing” gloomy bug started to creep in. Shooed that little naysayer away and signed up. I am so glad I did. It never fails, ideas come popping in like unannounced company. Backs of envelopes, trimmed paper, post its, receipts and the like were commandeered to stand in until I made it to wherever the notebook was hiding. I just kept entering without keeping track. I counted the last week to see if I made it. Thirty-six, really? Recount, yep, thirty-six! Funny thing, those little scraps keep appearing. Perhaps next year, they’ll go straight to the notebook. Nah, probably not! I think my ideas like to free range a bit. 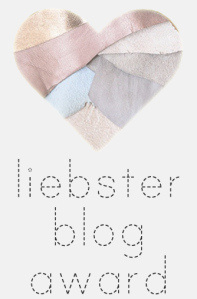 Liebster Blog Award – Thank You!!!! A “Thank You” shout out to Francesca at Flora’s Table for nominating my blog, The Backdoor Artist, for the Liebster Blog Award. Flora’s Table is a delightful cooking blog focusing on both authentic Italian cuisine dishes and traditional American dishes, suggesting appropriate wine pairings for each of them.Take moment to stop by, you’ll be glad you did. The Liebster Blog award helps spread the word about younger blogs, with fewer than 200 followers. I know, I know, takes time to respond to these things, but it is a great way to share some blogs with readers they might not otherwise find. Are there new, young blogs, I hope others find? Yes. I can certainly think of more than a few. So…because I appreciate the efforts of inspiration out in the blogosphere, I will play and pass it along. The adapted award rules for this one are the following: those who get nominated must answer 5 questions asked by the person who nominated them and tell 5 random facts about themselves. Then, each of them is supposed to pass on the award by nominating 5 blogs with under 200 followers and ask them 5 questions. Note: It was 11, but I am joining previous nominees by limiting it to 5. Considering the often overindulgence of this season, restraint is a good thing. I was born on a reservation. I believe being a parent is the most important full time job anywhere. I love my husband more each day. Q1. What’s your favorite book? A1. It varies, usually the book I am working on. Right now, it is one about a young bird named Percy. More on him later. Q2. If you could live in the past, which historical period would you pick? A2. I have no desire to live in any other time than the present. Q3. What’s your favorite drink? A3. Cold water with a squeeze of fresh picked lemon. If you could forever fund one single charity, which one would it be? What is your favorite volunteer activity? What is your silliest pet peeve? If you were a science fiction character, who would you be? It took me a few days to accept the nomination. You see, Tim is family. More on that upcoming in my Nov. 4 post, so stay tuned. I met my husband (my best friend) on a blind date 32 years ago. We have 2 wonderful sons, one of whom, along with his beautiful wife, have blessed us with 3 precious grandchildren. I am a retired professional photographer. 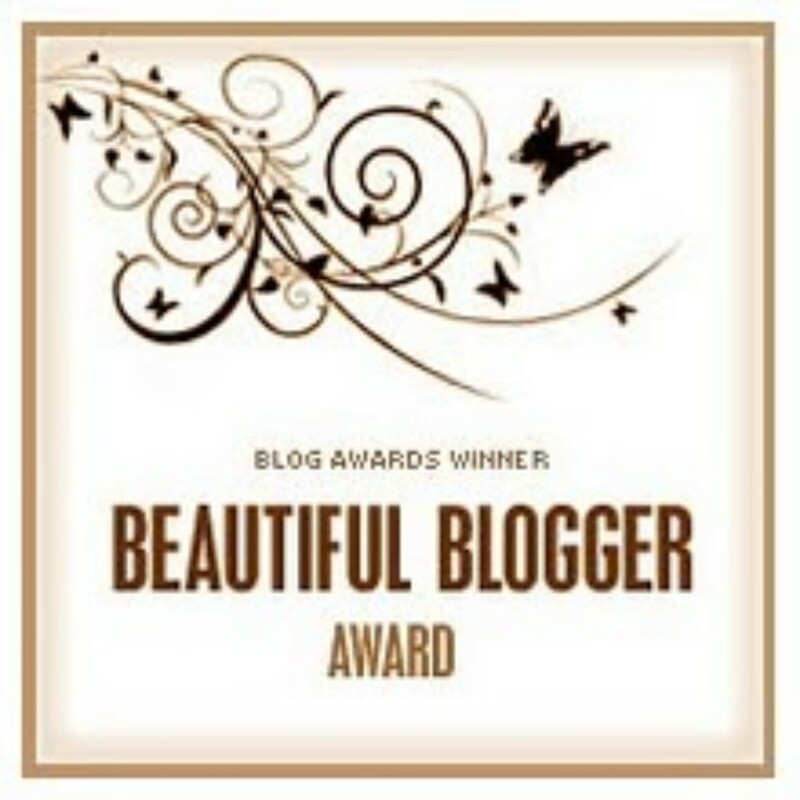 I chose the following bloggers because of how they inspire me in their recognition of beauty in the world. They may hesitate to accept publicly…believe me, I understand. Whether they accept or not, I want you to meet them, these people who live their gift and thereby bless the world with beauty. Congratulations and thank you for your contribution to the blogging community.